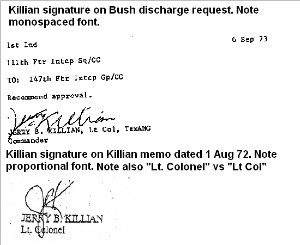 Gary Killian, who served in the Guard with his father and retired as a captain in 1991, said one of the memos, signed by his father, appeared legitimate. But he doubted his father would have written another, unsigned memo which said there was pressure to "sugar coat" Bush's performance review. "It just wouldn't happen," he said. "The only thing that can happen when you keep secret files like that are bad things. ... No officer in his right mind would write a memo like that." News reports have said the memos, first obtained by CBS's "60 Minutes II," were found in Jerry Killian's personal records. Gary Killian said his father wasn't in the habit of bringing his work home with him, and that the documents didn't come from the family. 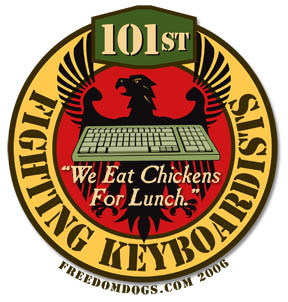 So now we not only have at least two of these documents using typefaces not available until many years after their dates, and only available on computers or expensive typesetting machines, but now Killian's family denies CBS News claims that the documents came from the late officer's personal files. That means the CBS source for the documents had no connection with the Killian family, calling the documents' alleged chain of custody into question as well. Why is that important? As long as the documents could be traced directly back to Killian and the personal files he retained after his retirement, then the fact that they were unsigned and used no letterhead could be explained away as personal memos for his own use -- the "CYA" affect. Now that Killian's family denies that they were the source, the lack of signatures and identifying headers mean that the documentation could have come from anywhere. They are, in effect, decertified. It doesn't look at all similar, and as Voice of Reason notes, the two abbreviations for Lieutenant Colonel are different. Why would that be? This fraud will have a dual effect of keeping every news organization from touching the TANG story again, and CBS will have to fire someone with a high profile to save face. Pull up a chair, get yourself some popcorn, and watch the meltdown continue.